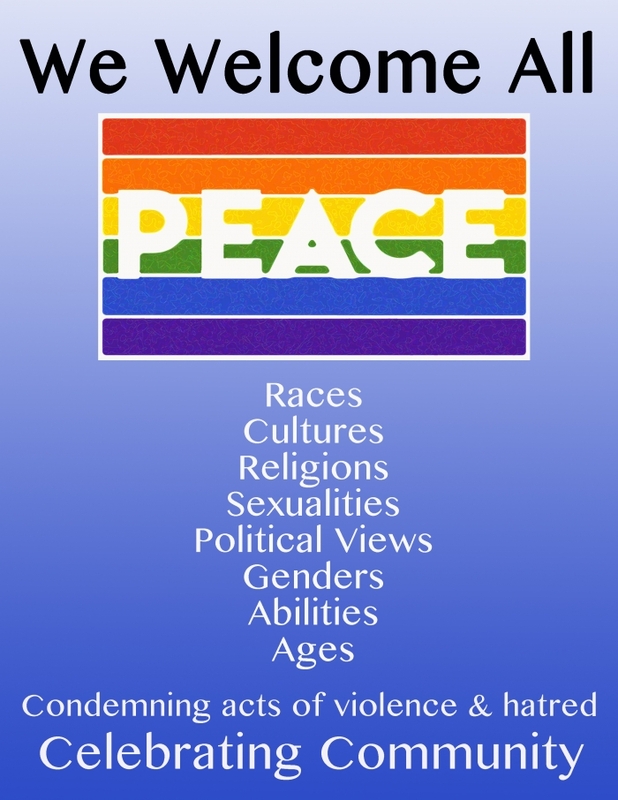 We've had available Rainbow Peace Flags, free of charge, to anyone who wants one. (Free Flag pick up is in Natick or ask a friend to deliver/send it to you.) Since starting this mission in June 2016 we've given away over 5000 flags, 2000 of which were a limited edition design by Natick artist, Virginia Fitzgerald. NEW, coming in November 2018, our new Rainbow Peace Inclusion Flag. To extend kindness and caring across national borders, with love that includes people of all sexualities, genders, abilities, religions, races, political views, and cultures, and to condemn acts of violence and hatred, embracing peaceful dialogue instead. 4 skin colors have been added to the rainbow colors, stripes have been turned vertical, rather than horizontal so that no color is above any other, and PEACE is written in black, not white. A community of voices contributed to the creation of this flag, designed by artist Virginia Fitzgerald. Get your flag and display it for all to see. Flags are free for pick up and donations are always welcome (donations support the purchasing of more flags). We've added the rainbow peace flag car magnet, too. You can take the message on the road (great for on your car). Magnet is suggested $5 to cover costs. New design coming soon. Also available for FREE: Welcome All door signs, too (download and print or email us and we will send you a higher resolution). This Welcome All sign will be updated soon with our new flag design with skin tone stripes added and PEACE in black. Note: You do not need to donate to get a flag or door signs. Supplies last as long as we have the funds. 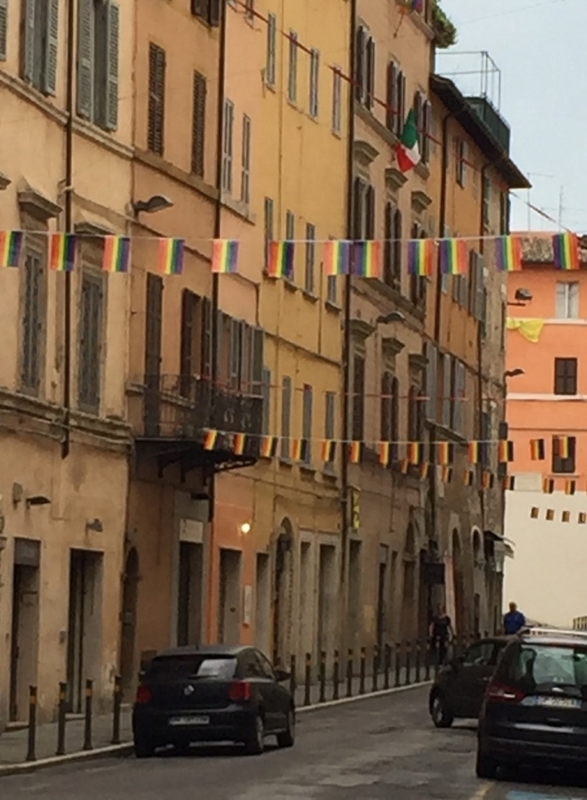 On a summer trip to Europe, our friend observed Rainbow Flags and Rainbow Peace Flags abundantly displayed. This wasn't the case in the U.S. And why not? Why would we not want to display a message of peace, solidarity, diversity and inclusion? Our message is in response to a big problem in the United States, at our borders, and all over the world. Let's show where we unite; that we embrace each others differences, and how we stand for PEACE! And let's watch this message fly one flag/magnet/door sign at a time across our local communities and beyond! 1. Get your free flag, door sign(s), and/or $5 magnet. 2. Donate to the Rainbow Peace Flag Project. If you are donating: (First, please know that a donation is not required and that you can get a free flag without donating as long as supplies last.) Of course, donations keep the project going, helping to get flags to all who would like them. If you would like to donate, click the "donate now" button. Enter the amount that you would like to donate and follow the steps for payment. All flags are to be picked up in Natick. Common Street Spiritual Center 13 Common Street, Natick, MA. Flags in lobby. See rainbow link on website for hours. Roots & Wings Yoga and Healing Arts 317 N. Main St., Natick, MA. Lobby, 9 am-7 pm weekdays, some weekends. First Congregational Church of Natick 2 East Central St., Natick, MA. Ring buzzer during open hours. Eliot Church of Natick 45 Eliot St., South Natick, MA. Ring buzzer during open hours. JOIN THE MOVEMENT! 5000 flags flying in Metrowest Boston & beyond, with message of peace, inclusion, solidarity & diversity. NEW DESIGN, speaks to the voices of today. Order yours now! * $4,348 in offline donations included in total.